Nassau County District Attorney Madeline Singas speaks at the Task Force’s inaugural meeting at the Morrelly Homeland Security Center. 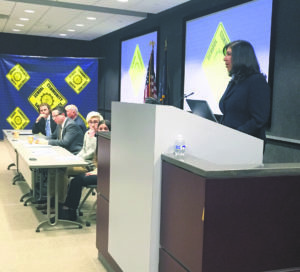 The Nassau County District Attorney’s Office has launched a new initiative that brings together law enforcement, mental health professionals, educators, religious leaders and community stakeholders to promote preparedness and improve information-sharing regarding potential threats. The Nassau County School & Community Safety Task Force was established to enhance the security of schools, colleges, places of worship and public buildings. Singas noted that privacy laws such as the Health Insurance Portability and Accountability Act (HIPPA) and the Family Education Rights and Privacy Act (FERPA) are frequently cited by medical professionals and school officials as obstacles to information-sharing regarding potential threats, but that both laws have clear exceptions for disclosures to law enforcement regarding imminent safety threats. The Task Force will explore the protocols in place at Nassau schools and colleges to share information regarding potential threats with law enforcement as well as assess the training and support needs of educators, religious leaders and private security officials at public buildings, including malls, to reduce the threat of a mass casualty event. The 30-person committee will develop recommendations and guidance to ensure that timely disclosures regarding individuals who may be a danger to themselves or others are expeditiously made to the appropriate parties in addition to preparing a training curriculum for educators and mental health practitioners regarding the health and safety exceptions to FERPA and HIPPA. A public report will be issued detailing the Task Force’s findings and recommendations. The task force will also engage religious community leaders to address concerns regarding safety at places of worship. Task Force members will work in committees focused on prevention and disclosure of threats, law enforcement collaboration and responsiveness, as well as legislative, privacy and training issues and will issue its report by year’s end. The Task Force has established a web site at nassausafety.org which affords the public the opportunity to submit questions, concerns or comments to the Task Force.